There's an unwritten rule of storytelling that it's usually not a good idea to start a tale in the middle. At or near the end, possibly; such a tactic has been used successfully in some movies and books. At the beginning, well, that's what we expect most often. But in the middle, when the story's already in full swing? It's just not done. Even if you have a really great anecdote that is the jumping-off point for your entire story, it usually relates to the beginning somehow. Otherwise, it's like entering the movie theater one hour into the film -- it doesn't make sense and is only a waste of time. The Japanese manga "Mythical Detective Loki Ragnarok," by Sakura Kinoshita, breaks those rules, making it difficult to understand where the story came from or where it's headed. But let's be fair: This is the bane of only the U.S. release. 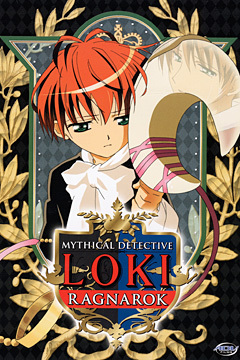 "Ragnarok" is the continuation of the original "Mythical Detective Loki" series, although "Ragnarok" is not a sequel per se. The word was added to the title for copyright reasons after the comic changed publishers in Japan, so "Loki" and "Ragnarok" are actually one continuous story. The series follows the adventures of Loki, the Norse trickster god who somehow has been encased in the body of a little boy and is stuck on Earth. To pass the time (or maybe it has to do with regaining his god form), he runs a detective agency specializing in the paranormal. But we can also only assume that he actually does solve mysteries, because he doesn't have any cases in the first two volumes of "Ragnarok." Certainly the only mysteries happening here involve deciphering characters and situations that we'd know more about if we'd only read the first series. Why he is trapped on Earth, we don't know. How and why Loki's children and other Norse gods came to Earth in the form of humans, animals and other creatures that defy description, we can only guess. What we do know for certain is that someone is after Loki's life -- most likely Odin, the great father of the Norse pantheon who apparently holds a grudge against the trickster. ADV IS bringing out "Ragnarok" and its corresponding anime in America. While this might delight those who managed to follow the first "Loki" in Japanese, it could lose potential fans because of its inaccessible story, especially since "Ragnarok" relies heavily on secrets and relationships revealed in the first series. For example, only after some vague hints in the manga and outside research into the Norse gods did I finally realize that Yamino, Loki's manservant in the manga, is actually Midgardsormr, also known as Jormungand, who is one of god-Loki's sons. ADV's David Williams said at the recent Kawaii Kon that a split in the Japanese companies that worked on "Loki" led to the U.S. release of "Ragnarok" over the first series. When asked if there are plans to bring the original stateside, Williams, a repeat K-Kon guest, gave his famous noncommittal answer: "Maybe." The 26-episode anime is far easier to pick up, as it starts with events from the first "Loki." We discover that Odin banished Loki to Earth and that other gods are out to kill him under Odin's orders. Most of the characters we meet in the "Ragnarok" manga -- Mayura, Yamino, Narukami, Reya and others -- are properly introduced in the anime. As a lover of mystery fiction, I was attracted to this series by its title alone. Disappointment set in when I realized that Loki is no prolific crime-buster in the sense that Conan from the manga "Case Closed" is. Couple that with the confusion caused by diving into a story that's obviously well on its way into being told, and "Ragnarok" is a sore letdown. Of course, it's easy enough to go on the Internet and look up information on "Loki." But full enjoyment of "Ragnarok" is dependent on knowing the first half, and it's impossible for a new reader to pick up cold. Had "Loki" originally been structured this way, it certainly wouldn't have passed muster. So while we're waiting for the first part of the manga to be released (if ever), stick with the anime instead. Or pick up both and reflect on this puzzle: If both the manga and anime are being released by ADV, why are the spellings of some names different in each one? THEN there's the manga "Zodiac P.I." by Natsumi Ando, another supernatural crime series that is almost as difficult to follow, and this time it's not the fault of a missing prequel. Here we have 14-year-old Lili Hoshizawa, a junior high-schooler who's made a name as a detective as her alter ego, Spica. Her mother was a famed astrologer who went missing two years ago, and Lili now uses her talents to take her mother's place. Also, with the help of her mother's ring that holds the spirits of all the signs of the zodiac, Lili as Spica goes the vigilante route, unmasking criminals and leaving the guilty parties ready for the police to pick up, along with the necessary evidence. At least, that's her plan. While she might have been successful at doing so in the past, her abilities in this regard seem to plummet by the time the story begins. Now, she needs constant saving and assistance by Hiromi Oikawa, a genius childhood friend of hers who at first refuses to acknowledge her. Hiromi, who is the same age as Lili, moved to America 10 years ago and earned a college degree in criminal psychology there before returning to his homeland. In good mystery style, there is a story behind Lili and Hiromi that is eventually revealed -- and easy to foresee. There is also a tragedy behind the disappearance of Lili's mother and her inevitable return. While Lili's energetic personality and general recklessness might be a plus for most teen-girl series, they're not really a good fit here. Her attitude and the resulting acrobatics distract from the cases, often twisting readers' eyes in several different directions at once. The temperamental zodiac spirits are just as distracting. Still, Lili's righteous anger against those who would destroy the happiness of others makes her awfully cute, as is to be expected of the heroine of a shoujo (girls) comic. Her passionate pronouncement that a criminal "deserves a 100 million light-year prison term," though inaccurate -- light-years measure distance, not time, although I suppose there are felons who merit a one-way trip to the far reaches of the universe -- makes her even cuter. Unlike most detective stories, many of the cases in "Zodiac P.I." are simple enough and don't get too involved. Some reach their solutions through dubious means because of the sparse details given about the major players, but a determined gumshoe could probably solve them. "Zodiac P.I." has too much energy to go on for long without tiring the readers. But at only four volumes, it makes a decent short series.